What’s on your calendar for today? This week? This month? If you can’t readily see your schedule and deadlines, things can slip through the cracks, or you can get overloaded. 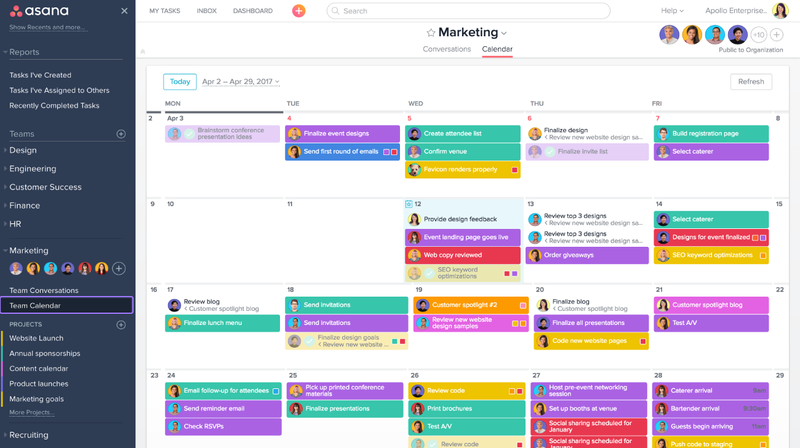 With Asana, you can see tasks and projects on a calendar to help you manage your time, workload, and deadlines. There are a few different Calendar Views in Asana. 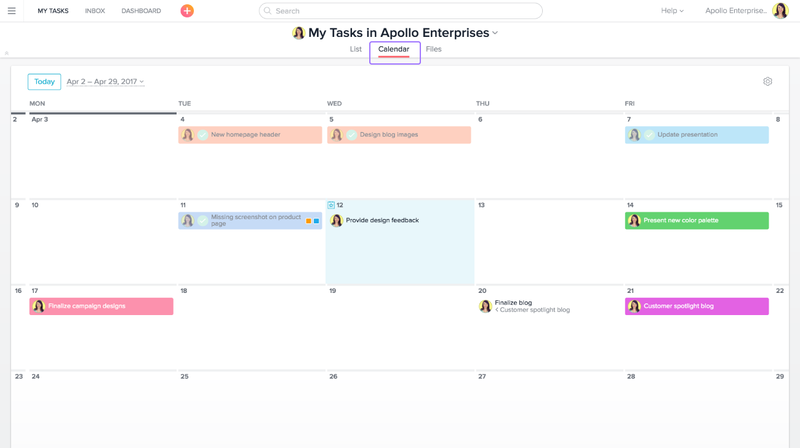 You can see your personal task list, any project, and all your team’s projects in calendar format. It’s also visible in our mobile app so you can quickly review or reschedule work when you’re away from your desk. For planning projects on a deadline, try Timeline instead. It will help you manage dependencies, have a solid schedule before you start, and keep your team on track as work changes. You might be used to seeing My Tasks as a list, but you can also see all of your tasks on a calendar, too. Whether you’re coming in on Monday morning, or wrapping up at month end, Calendar View helps you stay on top of deadlines and visualize your workload for the day, week, or month. The next time a teammates asks if you have bandwidth, double check your calendar in My Tasks. Click Calendar in the header. If you prefer to see all your tasks in Calendar View, set it as your default view. Create new tasks by double clicking on the due date you want. Or mark tasks complete by hovering over them on their due date and clicking on the check mark that appears. If a particular day looks crowded, you can move due dates by dragging and dropping the tasks to a new date. Use start and due dates for tasks to see the span of time you’ll be working on it. Knowing when to start is just as important as when to finish. Head to the Display tab of My Profile Settings to change the day of the week your calendar starts on. View any project on a calendar to keep track of completed tasks, upcoming due dates, and what’s on deck for the week or month. Calendar View is great for editorial calendars to make sure you’ve got a solid content schedule. Easily change due dates by dragging and dropping them on the calendar. Assignees will receive a notification about the change. Use Calendar View for projects like editorial calendars to easily see where you have content gaps, or event and sprint planning projects to make sure deadlines are reasonably spaced out. Use calendar filtering to sort by custom fields in any project to quickly spot top priorities, content types, approval status (or whatever you have custom fields for). Want to try custom fields? Get started with a free trial of Asana Premium to best organize your calendar. You also have a team calendar as part of your overall team page in Asana. The team calendar shows all tasks within your team’s public projects on a calendar. You’ll be able to make more realistic plans for your team’s new and upcoming work and get a feel for what they’re currently working on in one view. Click the team’s name in the sidebar. Check your team calendar during a planning period. You can better visualize when current projects will wrap up and when new work could start. Get an at-a-glance view of your team’s overall bandwidth at any given time. You’ll spend less time in check-in meetings or trying to gauge this based on email chains, chats, and other communications. 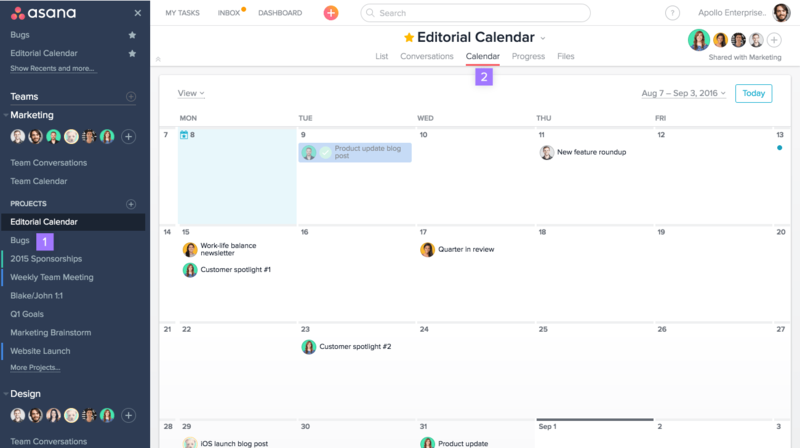 See Asana calendar in action and learn more by following along with How to Asana. Subscribe to the Asana YouTube channel for weekly tips and tutorials. 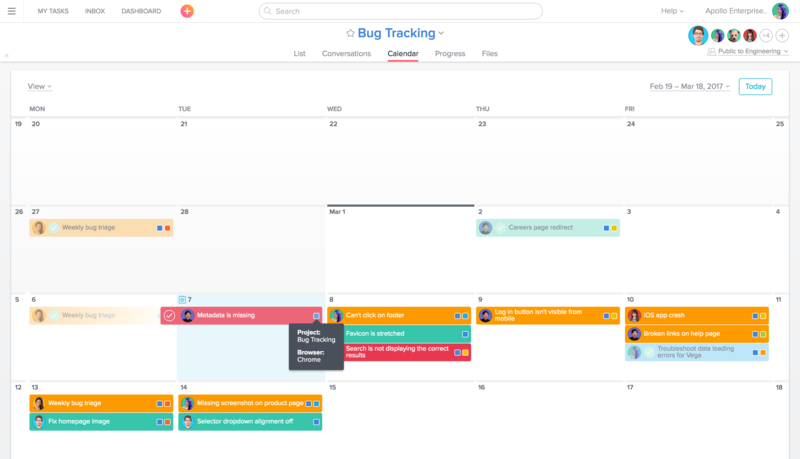 Stay on schedule, and know what’s next for you and your team to tackle with Asana’s Calendar View. Portfolios are ideal for portfolio leads, project managers, and executives to monitor multiple project statuses at once to see progress, priority, and problems.